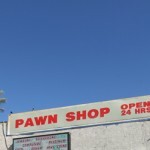 The Gold and Silver Pawn Shop is the infamous location of the hit History Channel show Pawn Stars. When we had regular cable television, this show was an auto stop while shuffling since we knew we’d get at least a few wonderful minutes of enjoyment out of it. We love the Old Man desperately forcing angry words over his uncooperative chin, Rick (cofounder with the Old Man) trying hard not to kill the old man while he sleeps at his desk, and of course Corey (the second generation) who, between hamburgers, seems to be planning the long-term sale of this ridiculous concept or at least figuring out a way to stop working there. And then there’s Chumlee, the real star of the show. Corey’s chubby childhood friend with the petite chin beard and a seven-year-old’s mind, would normally be the opposite of a chick magnet, but we have it on good authority that Chumlee is quite a hit with the ladies. Apparently basic cable, mid-level fame is quite an aphrodisiac for the ladies visiting Vegas. We had been to Las Vegas over a dozen times and each time we tried to visit, we were met with long lines, and since time WAS money in Vegas, neither of us wanted to waste precious time, we always opted to skip this attraction. This time, when our friend Rachel and some of her co-workers suggested visiting again, we decided to give it a shot, and we got lucky (more than I can say for our sports parlays over the weekend) – there was no wait and we walked right in. The store is set up with a long cattle-guide rope dividing the store in half. We walked past the cases where many of the cooler items are displayed – antique poker chips, knives, and a few items seen on the show. The store’s main business it appears is less the Pawn store and more the Pawn Stars themselves as the center of the store opened up to a gift area featuring anything and everything they could fit the Pawn Stars logo and likenesses on like t-shirts, pint glasses, bumper stickers, and much more. The souvenirs are, as expected, overpriced but once you get in the store, you have to buy something to commemorate. We grabbed a few postcards and Rachel bought a gift for her hubby back home – an autographed copy of Rick Harrison’s book “License to Pawn: Deals, Steals, and My Life at Silver and Gold. Then we walked down the other side of the cases filled with jewelry – primarily diamonds – and some of the famous Super Bowl rings seen on the show. We didn’t see any of the stars, but we didn’t expect to as we heard that, today, they are only in the store to film the show. I guess with their celebrity status they would get mobbed by fans. For more information, and for some Pawn Star items of your own, visit here. omg i watch this show all the time, to bad you counldnt be there while they were filming.